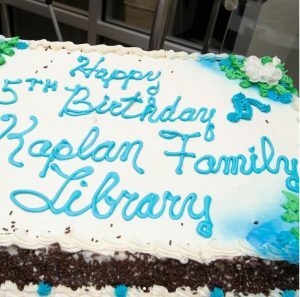 Jan. 29 marked the fifth birthday of MSMC’s Kaplan Family Library. Opened in 2014 as a replacement for the library that was once in Aquinas 100, the Kaplan Family Library’s mission is to “create a dynamic and responsive learning environment by connecting people with information,” and thus far, it has been quite successful in doing so. Since its opening, the Kaplan Library, in addition to offering a vast selection of books and other forms of media, has provided services such as writing help, housing many events and presentations as well as giving students a quiet place to work and study. Students, faculty and staff enjoyed free cake and ice cream on Jan. 31 as part of the celebration. In addition, over 60 people partook in a raffle, with Julie Wheeler, a student, and Doug Smith of the facilities department, each winning $25 in Mount Money. The library will continue with new events for Library Week from Feb. 11 to Feb. 15. Look for posters around campus for the schedule of events.